How Canada will meet its Paris Agreement climate-change commitments, while adapting to weather-related changes already impacting the nation, is shaping up to be a major issue in the next federal election. Some provinces have balked at embracing carbon pricing, part of Trudeau’s Pan-Canadian Framework on Clean Growth and Climate Change, while other voices argue the Framework simply doesn’t go far enough. Where should the policy conversation go next, given the state of the current public and political debate? Are there some policy solutions that have not been adequately explored; some that have been overhyped? Nancy Olewiler, an economist, is director of and professor in the School of Public Policy at Simon Fraser University. Her areas of research focus on public policy, including energy and climate policy, regulation and risk, and transportation. She has published in academic journals, edited books, provided reports for governments and written two widely used textbooks. She has served on several boards of directors and is a member of Canada’s Ecofiscal Commission and the Climate Solutions and Clean Growth Advisory Council for BC. She is chair of the Macroeconomic Accounts Advisory Committee at Statistics Canada. David McLaughlin is the International Institute for Sustainable Development’s director of climate change — Canada. 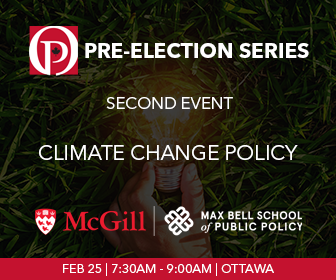 With over 30 years of public policy experience, he is a Canadian policy expert on energy, economy, environmental and intergovernmental policy issues. In his capacity as a public official, he has served as chief of staff or adviser to several elected officials. In his sustainable development work, he served as strategic adviser on sustainability, Faculty of Environment, University of Waterloo (2013 to 2015) and president and CEO of the National Round Table on the Environment and the Economy (2007 to 2012). Céline Bak is a global leader on the business impacts of climate change. She is the founder and president of Analytica Advisors, an Ottawa-based research and advisory business that promotes clean technology and innovation. She is also a senior fellow at the International Institute for Sustainable Development, where she leads research on sustainable finance with a focus on savers, investors and workers. She advises organizations on how to drive ambition and increase flows of sustainable finance by investors and corporations, and is frequently called upon by major media companies. She was appointed a Knight of France’s National Order of Merit for her contributions in the lead-up to the Paris Agreement.